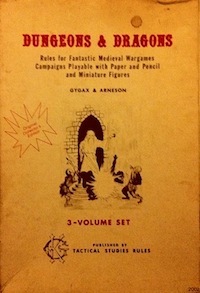 The Dungeon Crawl Classics RPG Beta Rules are can be downloaded for free. I just saw this link over at Beyond the Pale Gate, but the scratchings on the PDF seems to indicate that it is from June 2011, so you very well might already have seen it. If you haven’t, you are in for a treat. Even if you don’t have time to read the PDF right away (I certainly don’t), download it anyways just to skim through and look at the art. The many full-page Peter Mullen pieces are worth it alone. Not to mention the works by many other artists, including an excellent Erol Otus picture on page 44. The comics sprinkled throughout are also a nice touch. This entry was posted in Spotlight on February 13, 2012 by Necropraxis. Wow! The art in this thing looks the way D&D art OUGHT to look. Humor, horror and weirdness along with the heroes who endure them. Perfect. It’s interesting, regarding these recent releases, I actually find the internal black and white art far more compelling than the cover art. I find this true for ACKS, DCC, and Astonishing Swordsmen & Sorcerers of Hyperborea.